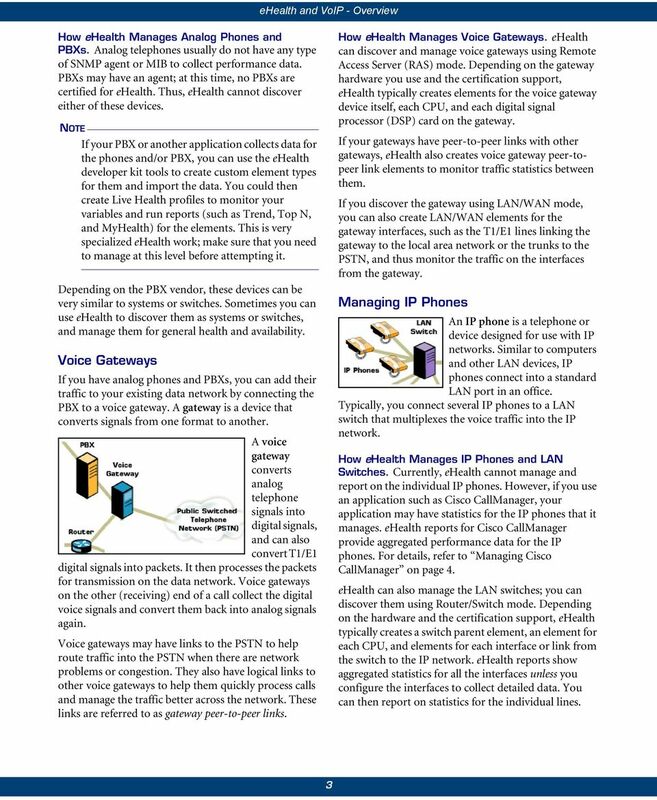 Download "ehealth and VoIP Overview"
1 ehealth and VoIP Overview Voice over IP (VoIP) configurations can be very complex. Your network could contain a variety of devices, applications, and configuration capabilities to support voice traffic. 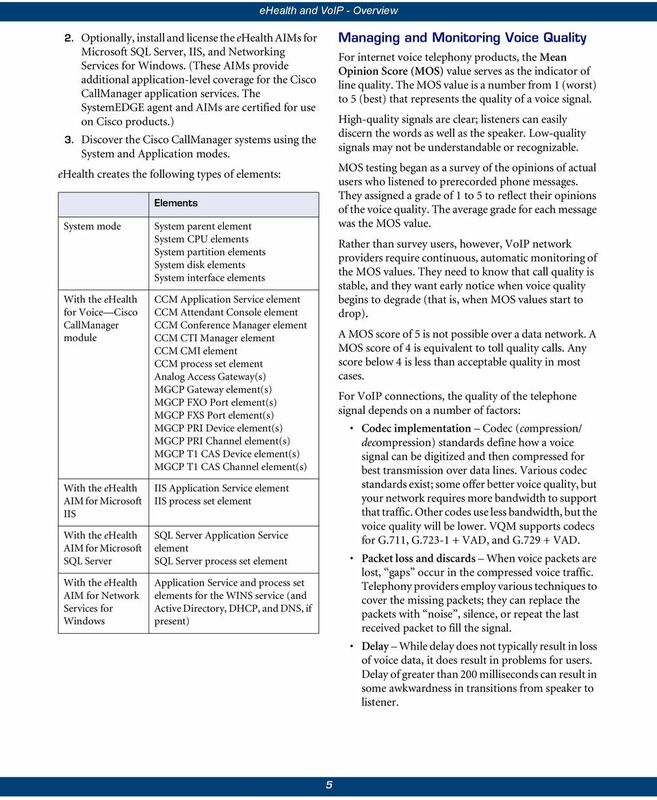 To manage VoIP, you must consider all the pieces and determine the types of questions that you want your management tools to answer. 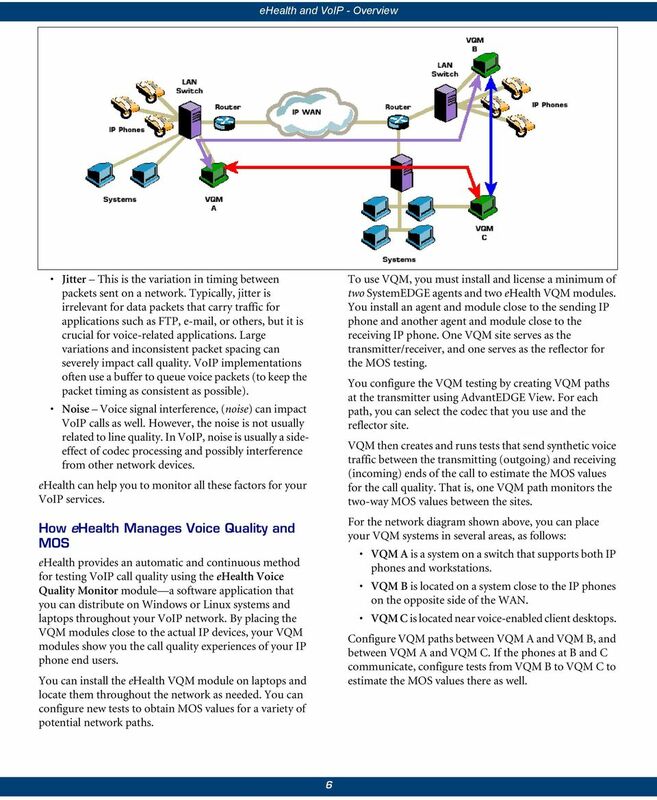 This topic provides an overview of VoIP components and describes how the ehealth Suite provides end-to-end management of a VoIP implementation. In most networks, voice traffic travels over a public switched telephone network (PSTN), while workstation and application data travels over an IP-based wide area network (WAN). However, the WAN shown above is a converged network it carries both traditional data such as , FTP, and business applications, as well as voice traffic such as telephone calls, teleconferences, and voice mail. 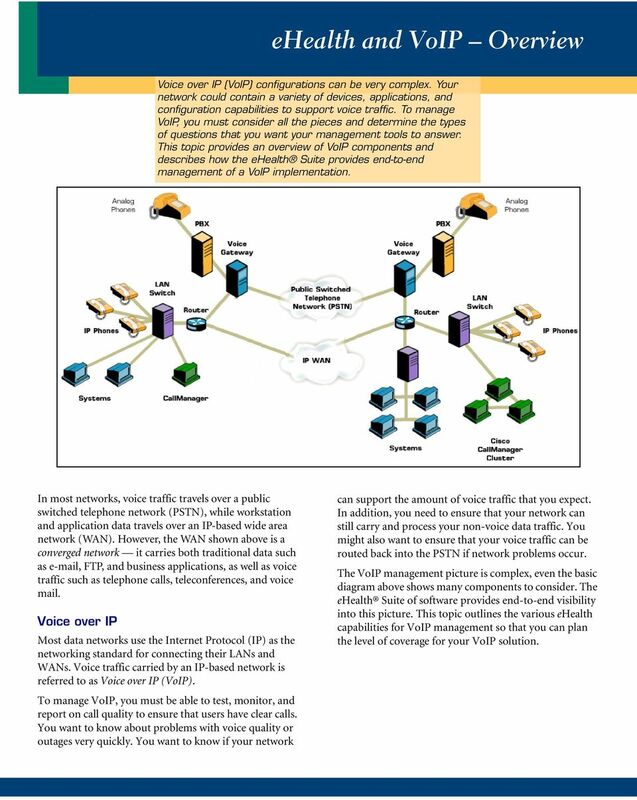 Voice over IP Most data networks use the Internet Protocol (IP) as the networking standard for connecting their LANs and WANs. Voice traffic carried by an IP-based network is referred to as Voice over IP (VoIP). 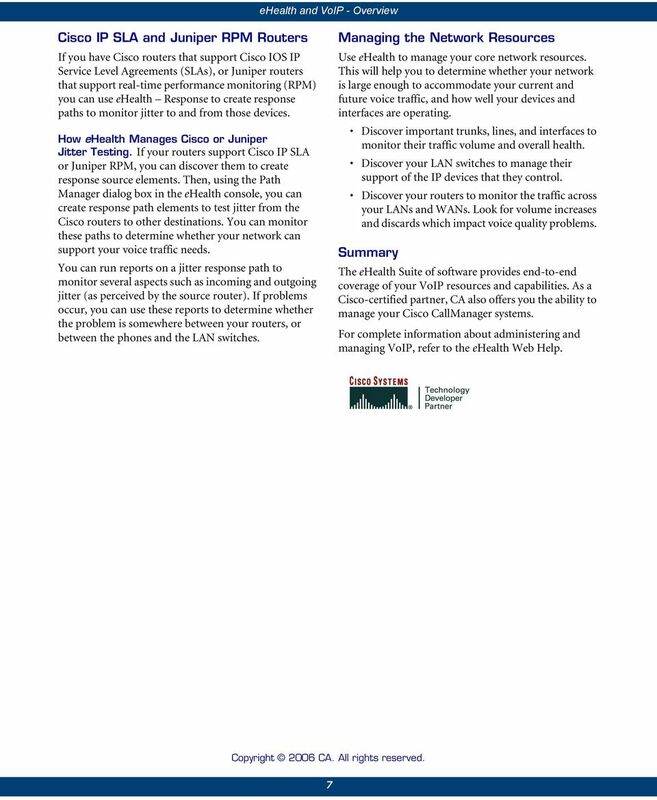 To manage VoIP, you must be able to test, monitor, and report on call quality to ensure that users have clear calls. You want to know about problems with voice quality or outages very quickly. You want to know if your network can support the amount of voice traffic that you expect. In addition, you need to ensure that your network can still carry and process your non-voice data traffic. You might also want to ensure that your voice traffic can be routed back into the PSTN if network problems occur. 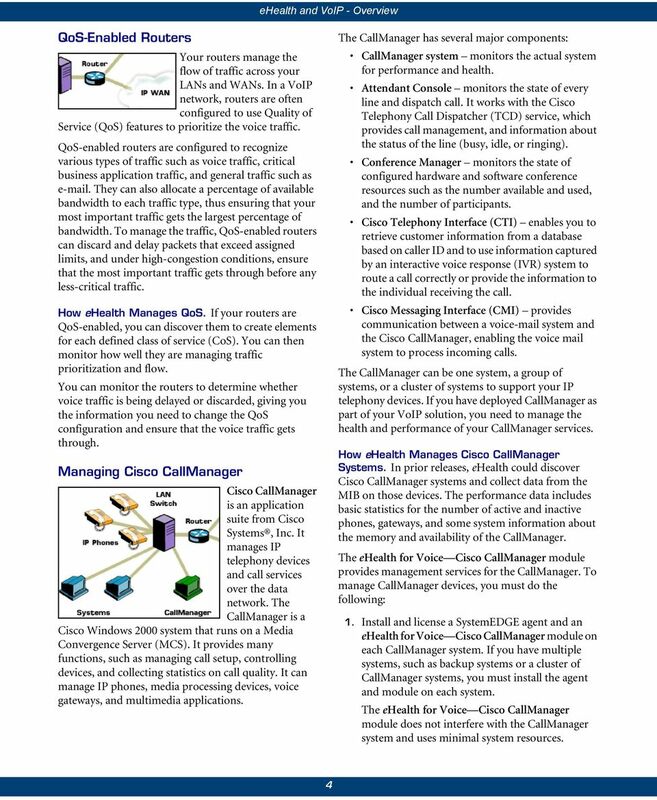 The VoIP management picture is complex, even the basic diagram above shows many components to consider. The ehealth Suite of software provides end-to-end visibility into this picture. 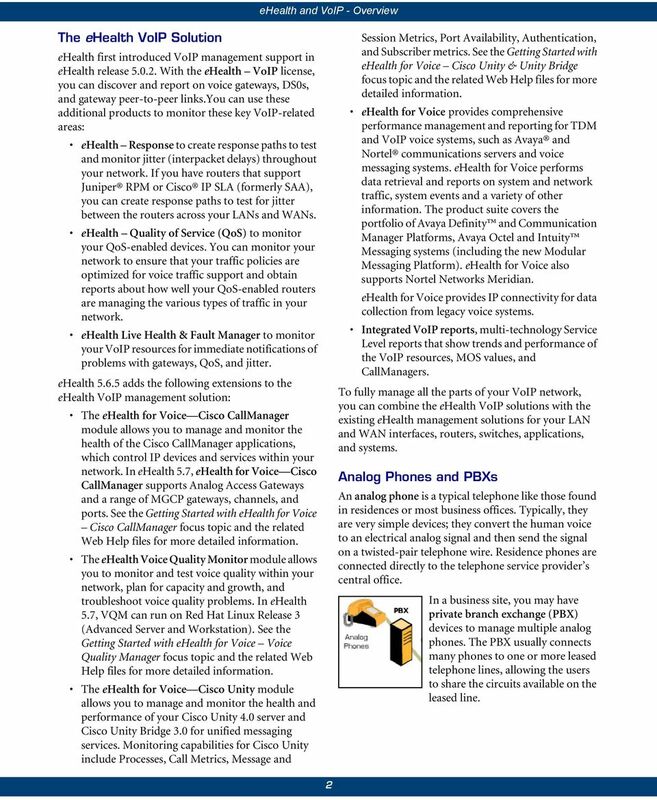 This topic outlines the various ehealth capabilities for VoIP management so that you can plan the level of coverage for your VoIP solution. CHAPTER 1 Introducing Cisco Unified Communications Express Cisco Unified Communications Express is an award-winning communications solution that is provided with the Cisco Integrated Services Router portfolio.